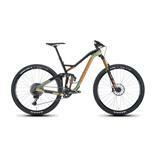 Frame, weight, hydraulic Deore brakes, Deore shifters/derailleurs... Color! 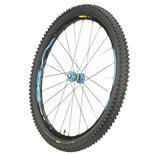 2014 Kona Kahuna, base model, size 19", 29" tires. I love this bike. Rides great and has never let me down (well.. Once, but my fault). I ride smooth single track, rocks, roots, drop offs, climbs, descents.... Pretty much all except dirt jumps and free ride type stuff. I upgraded the wheels to wtb i23 after I taco'd the front wheel on a small jump, and swapped the maxis ikons for Kenda nevagals. I ride this bike everywhere and keep up with the full suspension crowd on all but the most difficult terrain. The only thing I'm looking to upgrade now is the fork (xc32, spring, no air, 9mm quick release). I'm a Clyde (235 lbs) and I want to ride this bike on any trail I desire, so I'm looking at increasing travel to 120mm with 34 or 35 mm stanchions and a 15 or 20 mm axle. I'll also be adding a dropper post. It will be a perfect, at least for me, hardtail at that point. Oh, and it's bright orange... I love the friggin color! 90s rigid bikes. Mongoose Hilltopper, Scott Windriver. Big Funtime. Riding feels like you're in it not on it. A smiley ride and does what you tell it. Everything other than WTB components. Solid mid-level bike, let down by WTB components. Everything WTB, seat rails snap, rear rim cracks. 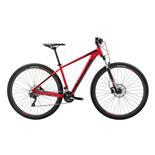 Used on mountain trails, no jumps, average 120km per week. Have owned since Nov12 and still enjoy riding the Kahuna with quality replacements for seat and rear wheel. I've been riding the heck out of this bike and I am thoroughly pleased. Granted some of the parts are less than stellar like seat and pedals, but those are easy to change out. Yes it isn't top of line, but what do you expect for $1200? For the money I think it is a worthwhile bike and riding it has been a pleasure. It is surprisingly light considering it is an aluminum frame 29er, but definitely not carbon fiber light. Overall, I'd say it is one of the best bikes in its price range and is well worth a look at if you are in the market for a 29er hardtail just over $1000. excellent mid-level bike. killer front fork. shifts smooth. I haven't ridden a mtn bike in about 8 years. Before that I rode signletrack for hours like a mofo. When I decided I was gonna ride again I wanted to check this 29 thing out. I was expecting the SRAM 5/7 combo to be weak, but its held up ok. Some seeking in extreme gears, but ah well. The fork is a work of art and its got a great WTB seat. Its an excellent platform to start with and then customize. That front tire scares me though, I feel like its gonna wash out a lot and I know as soon as I'm not scared of it I'm gonna get hurt. Easy to fix though. If you're an intermediate level rider and want to get on a 29, do it. You'll dig it. Very comfortable, climbs well. Frame sizes. Rear tyre clearence. 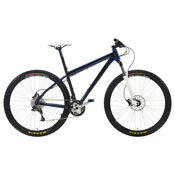 Some parts are not as good as similar price Cube and LaPierre. I have the 2013 verson of this bike. Its my first new bike in more then 15 years. When I was going through the process of choosing what bikes were worth test riding I nearly passed over this one. On paper, there is nowhere near the value the European brands like Cube and LaPierre are offering. This would have been a mistake though, after riding a few different bikes, most of which had better parts, I was struck by how comfortable the Kahuna DL was to ride, Konas many frame sizes mean that you are more likely to get the right fit rather then have to compromise if your body shape has a more between sizes proportion. I find the bike climbs well and also does well on the flat on any type of terrain, so far its been on fire roads, snow, roots and rocks on a mix of technical singletrack and forest trails. Desending is a different story though, not sure how much of that is the bike and how much of that is me, I suspect the latter :-) I have a bit of fine tuning to do on the handlebar width and some other minor adjustments that should help. The tyres are best suited to the summer if you are from the UK or Ireland, not a whole lot of thread depth there. The forks are a highlight, at this price though I would have expected a remote lockout as most of the other brands are supplying them. They work well, the 100mm travel has been enough for what i've thrown at it. They are easily adjusted and the travel is very smooth. The 15mm axel is a nice touch, it makes them feel secure and the steering really benefits from it. One thing I am slightly concerned about is the lack of tyre clearence on the back, makes me think Kona had a dusty riding environment in mind rather then a muddy one when it was being designed. I won't review the components, pleanty of detail around that on the web and reviews by people a lot more qualified to talk about them then me. In summary, if you are looking for a good all round comfortable bike thats good in a mix of terrain than I'd say its a good choice, If you are looking for an out and out race machine or a agressive hard tail then maybe better options out there. The price below is in €€ BTW. I was looking for a 29er HT as an all around bike- some mountain, some commuting, and some cruising around with my son in town. This was the perfect fit! the bike fit great, looks great, has very smooth shifting and is just super fun. My LBS gave me a great deal and now i'm sold on Kona.